Enable streamlined operations to promote employee success with people management solutions. The non-profit industry is unique. Furthering any worthy cause involves an unparalleled degree of accountability, openness, and integrity in the workplace. This dedication often creates many challenges in the process. From requesting IRS approvals to accessing solicitation codes from local governments, and plenty of paperwork in between, non-profits face obstacles that are not found in any other industry. These complex hurdles facilitate a different use of human capital management (HCM) solutions. Non-profit companies need comprehensive people management solutions that will work to streamline operations for them, so employees can focus on the organization’s success. Hear about the numerous benefits of a best-in-class people management solution from organizations that have already made the switch. 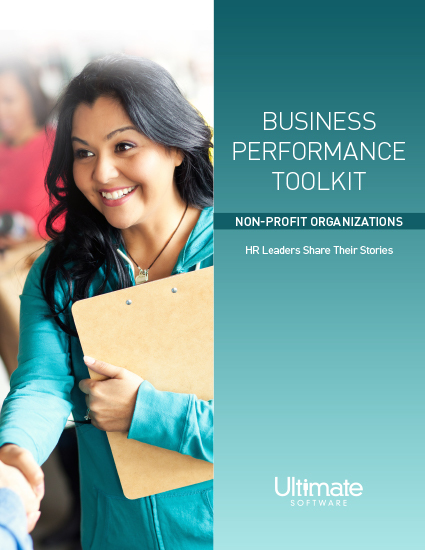 Read full article below or download a printable version of the Business Performance Toolkit for Non-Profits. What can comprehensive people management tools offer? The non-profit industry is unique. Furthering any worthy cause means an unparalleled degree of accountability, openness, and integrity in the workplace, and this dedication carries many challenges along with it. From requesting IRS approvals to accessing solicitation codes from local governments, and plenty of paperwork in between, non-profits face challenges and obstacles that are not found in any other industry. With these complex hurdles comes a different use of HR, payroll, and talent management solutions. Non-profit companies need comprehensive human capital management (HCM) that will work for them to streamline operations, so employees can focus on the organization’s success. These benefits are already being experienced by numerous charitable and socially-impactful organizations. They are leveraging these effects to put more time and energy into the organization, keeping employees, including HR and payroll staff, happy. Read on to discover how comprehensive people management tools are helping the non-profit industry, and how they can help you too. Uses HCM solutions to improve resource management, fulfill agency mission. PACE Center for Girls, Inc. is a nationally recognized social-impact organization that has transformed the lives of more than 39,000 girls at-risk in Florida since 1985. PACE serves more than 2,100 middle school- and high school-aged girls each year through its statewide network of 19 centers across Florida. In the past, regular payroll problems resulted in the need for HR and manager intervention, issuing off-cycle checks, and weakened trust between HR and PACE employees. The agency sought a new solution that it could configure and control, and could count on for data integrity and accuracy. PACE decided to make a switch to a more comprehensive solution in April 2013. Instead of trying to fit the lifecycle of an employee into an accounting system, the comprehensive solutions support an employee’s true path through an organization. According to Cancel, the intuitive design is boosting adoption rates among all generations in PACE’s workforce. PACE is using their cloud-based HCM solution to not only improve the way it serves its community, but also to report on its successes to the agency’s funding sources. HR empowers hiring managers to get involved in the requisition process by making all applicant data directly available to them, so the hiring managers can identify their preferred applicants. The time from job posting to hire has been reduced from 84 to 54 days. PACE’s onboarding process builds a positive experience from day one by enabling new hires to pre-fill forms anytime, anywhere, on virtually any device. By easily automating and simplifying the onboarding process, PACE new hires are engaged and productive employees from their first day. PACE’s consistently accurate payroll process builds employee trust and all employees are paid correctly and on time. Based in Staatsburg, New York, Anderson Center for Autism is a non-profit organization dedicated to providing the highest-quality programs for children and adults with autism. It operates a school and residential campus comprising 19 facilities, as well as more than 20 adult houses and three day-habilitation programs, called LifeLong Learning℠ Centers, distributed across three counties. The Anderson Center was previously using an on-site, paper-intensive HR solution. The organization sought a replacement that would provide insight and functionality to help attract and retain a high-performing workforce, and to help streamline HCM operations. By streamlining Anderson’s HCM processes, the solution is also helping the organization save substantial time and money. For example, the solution completely automates a payroll process that once required employees to submit weekly paper documents to the payroll department for manual verification and entry. According to Paulk, cloud-based HCM has cut paperwork by 95%, and the organization’s headcount has grown 60% without any increase in the number of staff used to support payroll and administration. Furthermore, improved visibility into overtime costs has helped the organization correct staffing levels and bring overall costs down. With additional resources now available, Anderson is able to prioritize training for its staff. “Training is essential for our highly-regulated organization,” said Paulk. “strategic, cloud-based HCM has enabled Anderson to increase the amount of time staff spends on training and certifications by 30%.” With the switch to a cloud-based HCM solution, Anderson Center for Autism was able to eliminate system downtime, identify potential flight risks, as well as increase the amount of time spent on training and certifications. SourceAmerica serves as the interface between the government customer and non-profit agencies that employ individuals with disabilities. These non-profits produce products such as flags and military uniforms, and provide services such as recycling and grounds maintenance. Prior to comprehensive cloud-based HCM, SourceAmerica used completely separate HR and payroll systems to manage its human capital. SourceAmerica sought a cost-effective HCM solution that would give the company better visibility into its data and drive culture growth with better functionality. SourceAmerica went live with a strategic and comprehensive solution in October 2015. With a master system of record, the organization is experiencing improved data efficiencies, and its HR processes no longer include time consuming duplicate data entry. The organization is focused on using HR technology to drive a high-performance culture. Capps noted specific examples of how the HCM functionality is improving the SourceAmerica work experience, such as boosting morale with the solution’s goal-setting process, and better time to productivity for new hires with onboarding tools. While the comprehensive solution is delivering a great work experience to employees and managers, SourceAmerica’s HR team is also using business intelligence to build relationships with the organization’s executives. By upgrading to one single solution, SourceAmerica was able to experience higher morale, better communication with senior management, and less time to generate reports. For non-profit organizations, HR and payroll solutions should not be at the forefront of your mind. Your time should be devoted to benefitting your community, helping others and enabling your organization to grow. That’s where people management tools come in. A comprehensive HCM solution helps non-profits leverage HR and payroll to enable employee success. By making the switch to a best-in-class HCM solution can enable streamlined operations to empower your employees to focus on the organizations success. To learn more, watch a brief overview tour for non-profits and click here to download the Business Performance Toolkit Whitepaper for Non-Profits. Please fill out this brief form to access your non-profit toolkit.